We have discussed about intellectual games such as QuizUp and likes, in the past. Rumor has it that these games are made only for the geeks, but take it from me that even the most extreme among enthusiasts would find 2048 interesting. 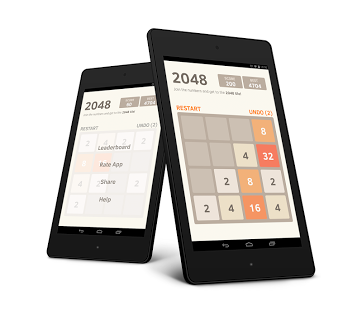 2048 is essentially a number puzzle game for your Android device that has the potential to keep you engaged for hours. It is primarily a puzzle game where the player needs to merge tiles with same numbers to form a single tile with a larger number. Each and every time we move a tile, another tile with a new number pops up on the game board. When we line up same number tiles and merge them, a single tile with larger number is created. This feels quite easy initially but as we move up the numbers, it becomes extremely difficult to line up larger number tiles, especially with all the smaller number tiles on the board. The game essentially seeks a strategic approach. As we progress along the game the number of tiles keep piling, and soon there comes a time when the board runs out of space to accommodate new tiles. Eventually, the process of merging like tiles gets difficult. The aim is to get 2048 tiles and win, but it becomes almost impossible to achieve this feat. There is absolutely no room for errors such as a wrong move that double up tiles. A wasted move would only result in failure and the player has to start from the beginning again. The game starts with tiles numbered 2 and 2. Gradually the game gets complicated as it becomes difficult to analyze the correct placement and movement of tiles. The game does not have time restriction and hence it highly advised to take time and plan a move. Contemplate on the consequences of taking that step. We have to be careful as things can go out of control if we stack unlike numbers and then, soon game will get over. Spoiler Alert! – Maybe one can try moving all the larger tiles to one corner of the board and use them, only when there is a need. 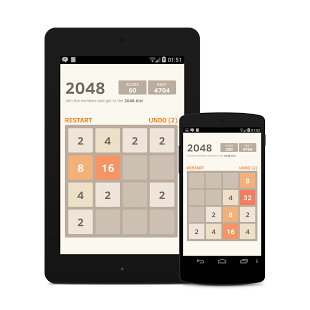 There are similar games but the features of 2048 make it outsmart the herd. The swipe function in this game is effective for the whole screen area. Players can share scores online such as in social media and compete in leaderboards. The game will continue even after scoring 2048 tile. It is specifically optimized for all mobile devices. Frequent improvements are implemented based on user feedback. The game runs a smooth user interface and the instructions are pretty simple and easy. In fact, it’s only the swipe function, but unlike many other ‘swipe to play’ games, the swipe response is impressive in 2048. Also, the sensitivity of the touch/swipe can be adjusted according to the user’s convenience. Menu navigation is smooth too. Overall, I would like to say – try this game only if you have time because it gets addictive!